Part of the conservative argument necessarily requires dealing with criticisms that come from the left. The frustrating thing about these criticisms is far too often the left’s arguments do not conform to any version of reality regarding the conservative position, and the two political ideas are constantly juxtaposed in ways that make no sense philosophically. This makes most engagements with leftists totally unproductive. Unfortunately, the left is not alone in this cognitive dissonance (www.simplypsychology.org), as half truths and outright jingoism with often no relevance at all to conservative ideas are freely ascribed to by both sides. Certainly there are plenty of people on the right who are misguided in their beliefs regarding what is “conservative”, so much so that their political ideology seems to be very much “I believe something different (but equally wrong) than those people believe”! So this article is directed less at the left and more at fellow conservatives. Now, please take this article with a grain of salt or sugar, whichever suits the palate best, and try to put aside any immediate urge to reject this out of hand. The basis of this argument is based on the established philosophical positions of John Locke, Adam Smith and Thomas Jefferson. So if anything in this article offends, then perhaps the reader should reevaluate whether they are putting their own personal beliefs in place of the established orthodoxy of conservative libertarian classicism that find their roots in Plato and Socrates. As this article is intended to be a kind of “Epistle to the Conservatives”, if it stings a little, then that’s intended. Why Are We “The Right” Anyway? A great deal of confusion arises from the words that are used to describe our polar political positions (left versus right). It’s why the political atrocities of Hitler are misattributed by leftists as being “right-wing”, which gives them some semblance of moral cover as they struggle to extricate themselves from the atrocities of Stalin and Mao. In their minds, since Hitler was “right-wing”, at least conservatives have a good deal of blood on their hands, too. Unfortunately for leftists, there are stark differences ideologically between what is considered “left” and “right” in the United States and what those very same labels mean in a European context, particularly in the early 20th Century and coming out of the 19th Century. Long story short, what is orthodoxy today, may become the heterodoxy tomorrow, and this is most clearly demonstrated by looking at the Founding Fathers, respected to the point of reverence by the “right” for their classically liberal political wisdom and widely dismissed by the “left” for being capitalists and slave holders who promoted wealth inequality. Curiously enough, however, in the days of the Revolutionary War, the classical liberalism of John Locke and Adam Smith put the Founding Fathers very much to the “left” of the rigid authority of the Crown of England and its expansive Empire. The “left” and “right” convention gets murkier in a politically complex society under economic and social stresses, such as when Adolf Hitler was rising to prominence in German politics through agitation and appealing to cultural heritage in the 1930’s. Would Hitler’s radical pro-worker’s rhetoric have been “left” of the post World War I government of the Chancellor? Was his psychotic hatred of the wealthy and industrious Jewish people to the “right” of anti-capitalist socialists? Did Hitler’s embrace of nationalized heavy industries and higher education for the sake of “The Reich” put him to the “left” of capitalists? Did Hitler’s rejection of international and egalitarian communism put him to the “right” of socialists? Did his abolition of militias that were not affiliated with the Nazi Party and disarming of “un-German” underclasses put him to the “left” of libertarians? The reality is that in the scheme of political discourse what ends up being called the “left” or the “right” has largely been an arbitrary product of popular consensus, rather than any hard and fast application of political theory. We are, however, stuck with the dichotomy, because, even as arbitrary as it is, it’s still an effective shorthand to communicate differences between political ideologies. It’s just important that everyone, regardless of their personal political beliefs, understands that there is not homogeneity within any political ideology. There is no such thing as a monolithic institutional “left” or “right”, but there are fundamental values that are intrinsic to the ideas of both. 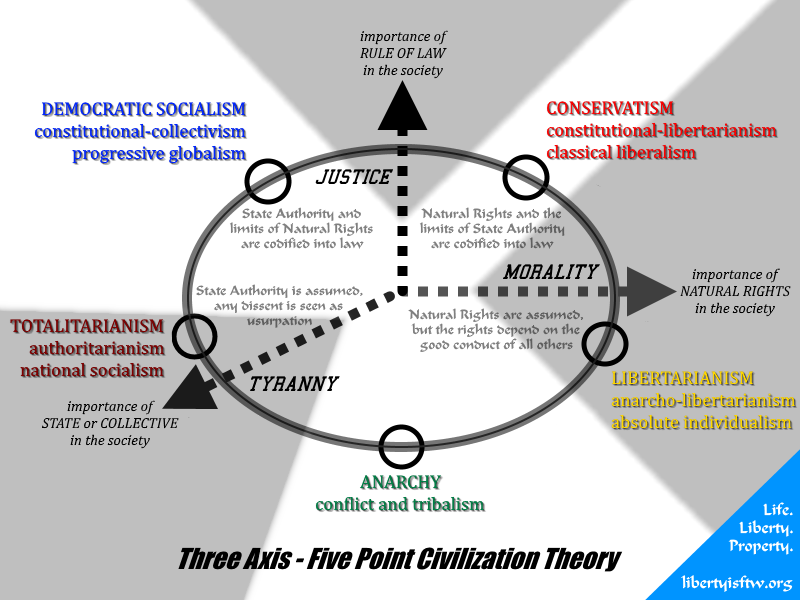 As far as Liberty is For the Win, the political spectrum is less a line than a cycle of political positions where political identities will circle around from totalitarianism to individualism and back again, often in the course of a single lifetime. Individuals each have their own internal compasses that spin in whatever direction their personal beliefs may lead them, often in naive attachment to political ideologies utterly contrary to their espoused orthodoxy. This happens when the orthodoxy is unclear, so let’s make clear what we have been given as of first importance, so we can speak clearly about conservative “doctrine”, as opposed to the mystery soup that is slopped around colloquially today. Instead of trying to cleverly rewrite what has been so clearly written, let’s establish this as summing up very succinctly the core doctrine of conservative thought. We hold these truths to be self-evident, that all men are created equal, that they are endowed by their Creator with certain unalienable Rights, that among these are Life, Liberty and the pursuit of Happiness (“property” – Locke). That to secure these rights, Governments are instituted among Men, deriving their just powers from the consent of the governed, That whenever any Form of Government becomes destructive of these ends, it is the Right of the People to alter or to abolish it, and to institute new Government, laying its foundation on such principles and organizing its powers in such form, as to them shall seem most likely to effect their Safety and Happiness. The primacy of individual rights. That is Natural Rights exist regardless of what the government may attempt to impose or whether a government even exists at all, and any government is subservient to the People, and not the other way around. The necessity of rule of law. That is Natural Rights are so precious that governments are built to protect them, not to usurp them, and the best way to protect Natural Rights is through an objective set of laws. In order to be right of center, we must believe, at the very least, in the primacy of individual rights to “life, liberty, property, and the pursuit of happiness” (Locke and Jefferson). These rights come not from any authority of the State but are endowed to the People by nature of being human beings, capable of thought and action. Any attempt by another individual or the State to remove these rights is a transgression of that endowment. To be fully and truly conservative, you must take the extra step to acknowledge that there exists at least some necessity of rule of law through which to protect these endowed rights, to which the People can peaceably appeal against minor transgressions of their rights by others. This creates a social compact by which transgressions can be objectively identified and punishments can be justly applied. While a legitimate debate about what constitutes “rule of law” is consistent with the principles of conservative thought, any exemption on the orthodoxy of primacy of individual rights immediately disqualifies an individual as being a conservative or even being “right of center”. The assertion that there exist legitimate exemptions to the primacy of individual rights implies the authority of the collective or the State to usurp the Natural Rights of the individuals. The justification for this is always either that the good of the collective or of the State is higher than rights of the individual, which violates the definition of “primacy”. For example, the left will impose taxes on individuals, usurping the individual right to one’s own labor, then turn around and use the revenue to fund subsidies to companies or organizations consistent with their ideology, or to build palaces and buildings that increase the power and wealth of the State, against the unanimous will of the People. And, without any irony, the leftists will blame the subsidies on capitalism and conservatives, when the funds wouldn’t have existed except for the violation of conservative values, and the very providing of subsidies violated the tenets of capitalism in the first place. As conservatives, we must reassert our devotion to these two principles: primacy of individual rights and necessity of rule of law. While we may legitimately and necessarily wrangle with the issue of the extent of the rule of law, the primacy of individual rights is something we cannot compromise on and still consider ourselves conservative in any American theory of the word. When a conservative is wrong about a position of the primacy of individual rights, then it is crucial that we challenge them on that position, and try to bring them back to the orthodoxy with firm conviction. How can we expect leftists to at least treat our arguments consistently if we cannot even do that ourselves. Thanks for pointing me to this site. I enjoyed the give and take last evening on Twitter. I like the line…”what is orthodoxy today, may become the heterodoxy tomorrow.” That is so true. I would add to your Hitler thoughts that one problem was the humiliation Hitler felt Germany suffered in the Treaty of Versailles. He was determined to correct what he felt was an over-reach. Your points are well taken. I was a Reagan revolutionary from as far back as 1976 when I was a college kid. I was conservative before it was cool! I am a bit of a dichotomy, though, because I am now an atheist, and while I may be considered somewhat liberal on some social issues, I am still conservative on economic and military issues. I will enjoy reading more of your writings and will comment as I find something of interest.